This guide goes over how the beta app generally functions and will continue to be improved and updated as new versions of the app are released. 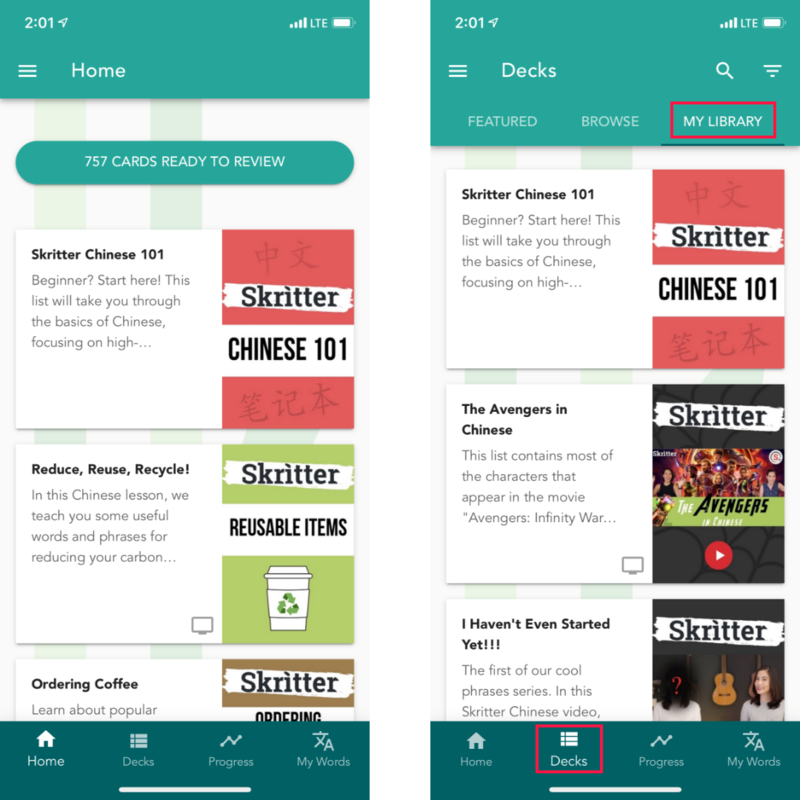 The Home screen allows you to quickly access all of your active decks (lists) on Skritter. Daily reviews appear at the top of the screen until the queue has no cards due anymore. After tapping the button you can configure your review activity any way you'd like. Long-term retention and focused study on the things you struggle with the most on Skritter. Try to study your queue to zero daily as often as you can. If you have too many cards due you can choose to focus on a smaller set of cards by selecting how many cards appear during an activity, which can be great for setting smaller daily study goals! *Note: The ability to continue studying cards marked as forgotten during daily activities will be coming to a future version of this app. Decks (Lists) are a collection of characters, words, and phrases. The decks that you are actively studying from will appear on your Home screen for quick access. To access all decks (active, reviewing from, and decks you have created) go to the My Library tab from the Decks screen. View the contents of a deck, and access Learn mode and Test by tapping on the deck of your choice. Once on a deck's main screen, you can see details about your progress, or go to specific sections. From the main screen you can go into a learning activity (tapping the button will you to the next un-studied item in the deck based on overall deck progress), take a deck-level test, or go to individual sections for more focused studying and testing. *Note* Deck management is still in development, so it’s currently not possible to modify lists on the mobile beta. In the meantime, you can do this on https://skritter.com for now. The ability to create, edit, and copy decks are in development and will be coming soon. Study new vocabulary from the deck (or deck section) of your choice. The learning activity will take you through an item's definition, reading, tone (Chinese only), and writing. Once all cards have been studied or skipped the item will be marked as studied (indicated by a green check-mark) and it will appear for review in 24-hours or less. A focused learning experience that shows comprehensive information about a card before teaching the proper stoker order and allowing for lots of character writing practice. Learn anything you want at your own pace. Perfect for classroom settings and more casual learning with Skritter’s hand-made content or tons of textbooks and decks. A study mode designed to help short-term memory and comprehension. An opportunity for extended practice to help solidify new things you're learning for the first time, and a way to quickly and repeatedly study vocabulary. Perfect for preparing for daily vocabulary tests, or studying targeted sets of vocabulary from decks or deck sections. Also, great for a quick personal challenge of the things you’re learning! Tests target short-term memory. Extended practice to help solidify things you're studying in Learn mode and increase your chances to mark " got it" with confidence the first time it appears in your review queue! *Note: Expired subscriptions can only test learned items on Premium content. *Note: The ability to view and study incorrect cards at the end of a test will be coming in a future version of the app. 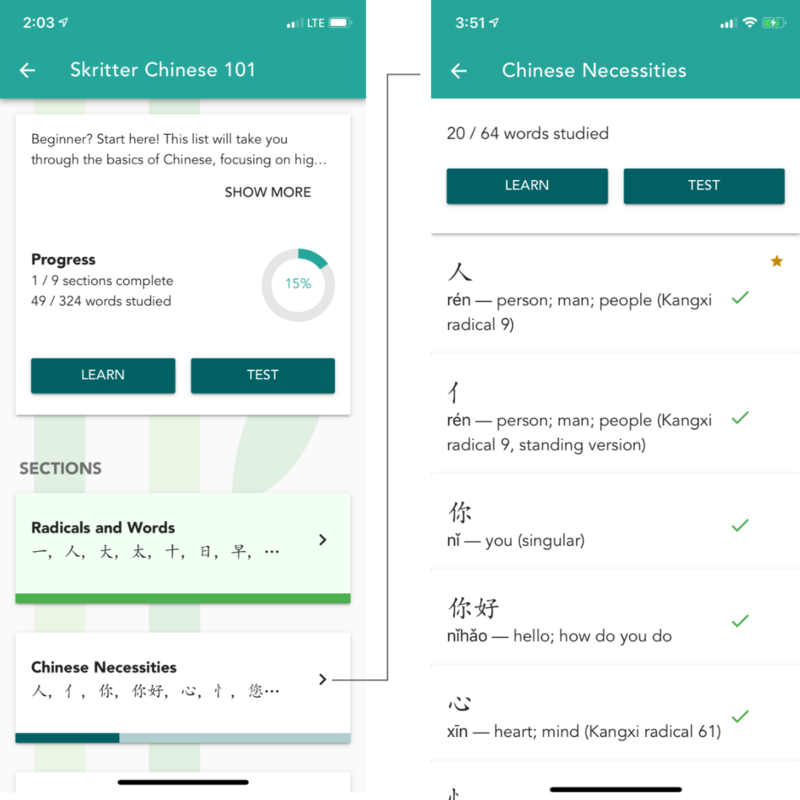 Skritter was built first and foremost to be a tool to help you learn to read and write Chinese and Japanese. Depending on the study mode you're using the writing canvas might look slightly different than what is pictured above, but the core functionality will always be the same. 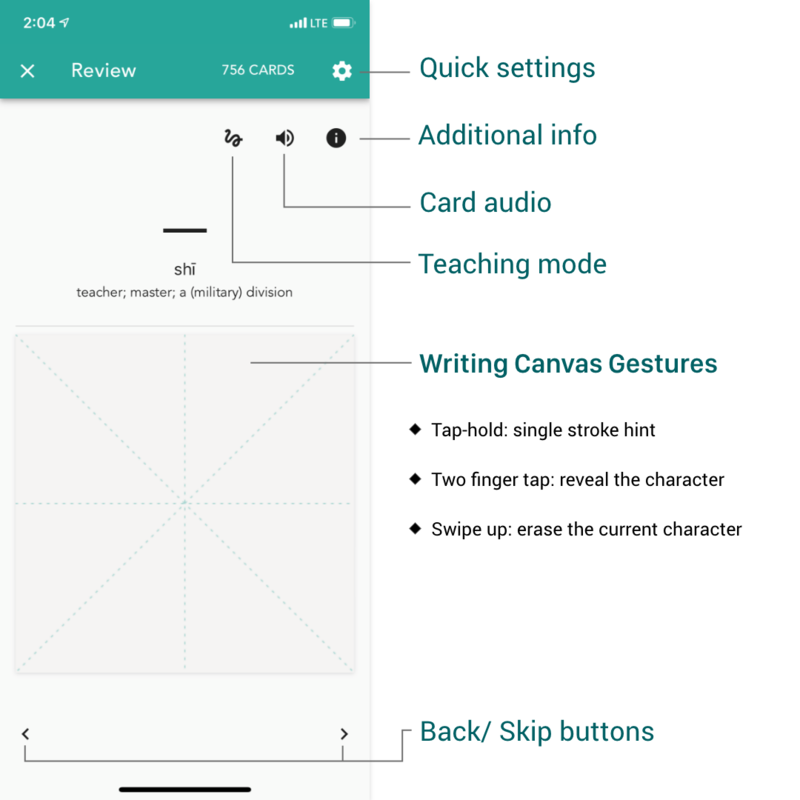 From the writing canvas, and other cards you can access the Quick Settings menu on the top-right of the screen. Open the Additional Information screen by tapping the icon or by sliding your finger right to left from the right side of the screen. On this screen, you can star and ban vocabulary, edit definitions, add/edit mnemonics, view your study progress, and write custom example sentences (coming to a future version of the app). Vocabulary audio is indicated by an Audio button on both study cards and the Additional Information screen*. If you open this screen before answering a card, it will automatically be marked incorrect ("forgot"). * Note: We strive to provide high-quality audio from native speakers of Chinese and Japanese in our applications and are adding new audio to Skritter regularly. Tapping the Teaching Mode button automatically plays vocabulary audio (if available) and helps you check a character's composition and stroke order. It also marks the card as incorrect, which you can change manually if necessary. Finally, you can navigate Back and Forward during your study activities. The Back button is useful for going back to re-write characters, correct accidental taps, and adjust grading. The Forward button automatically marks something as correct ("got it") and skips to the next card or part of the card. 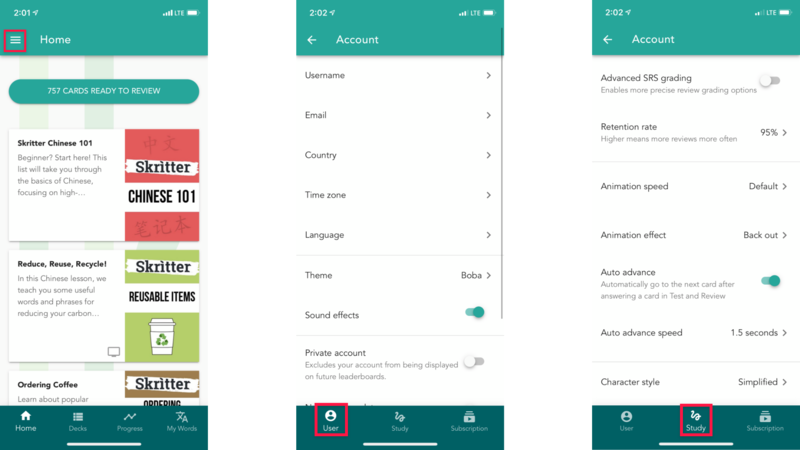 To access your account settings, tap the hamburger icon in the upper left corner from any of the main screens in the app and then select Settings from the slide-out menu. Select between User, Study, and Subscription settings at the bottom of the app. Study settings for Skritter have been designed to try and meet all of your learning needs. Learn more about each setting in-app or below. Advanced SRS grading: Turn this on for the classic 4-button(forgot, hard, got it, easy) Skritter experience during Review mode. 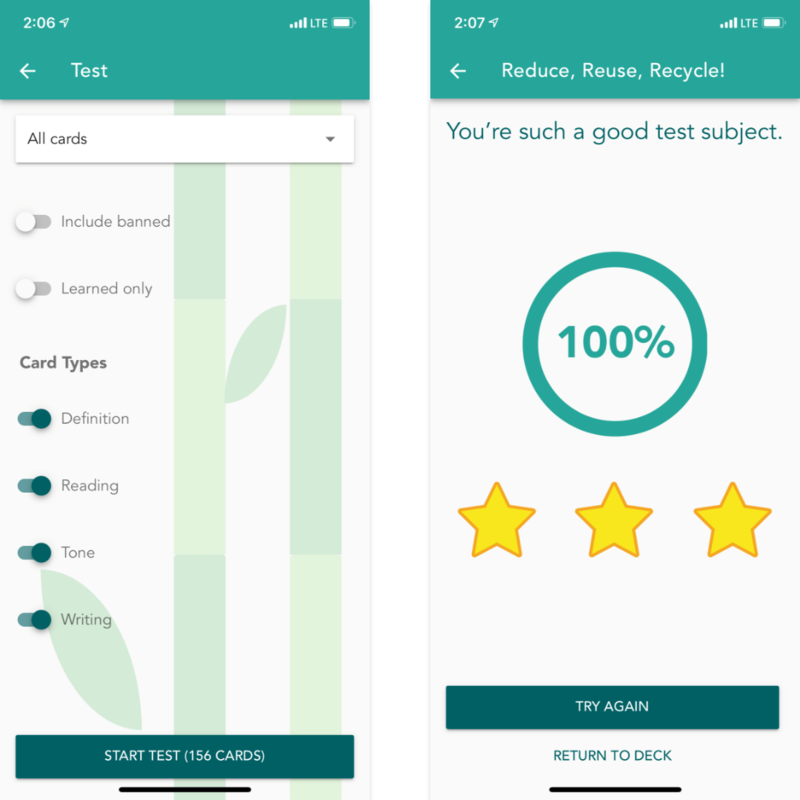 Retention rate: Control your target retention rate for each card you're studying in Review mode. A higher retention rate means more reviews more often. Animation speed: Adjust how fast stroke animation snaps to the canvas. Animation effect: Set the style of the stroke animation. Auto advance: With auto advance on, you can control the amount of time between cards once a grade has been detected. You can pause auto-advancing by tapping near the center of the screen at any time, which makes adjusting grading or re-writing a character again a breeze! Auto advance speed: Adjust the amount of time it takes to move to the next card. 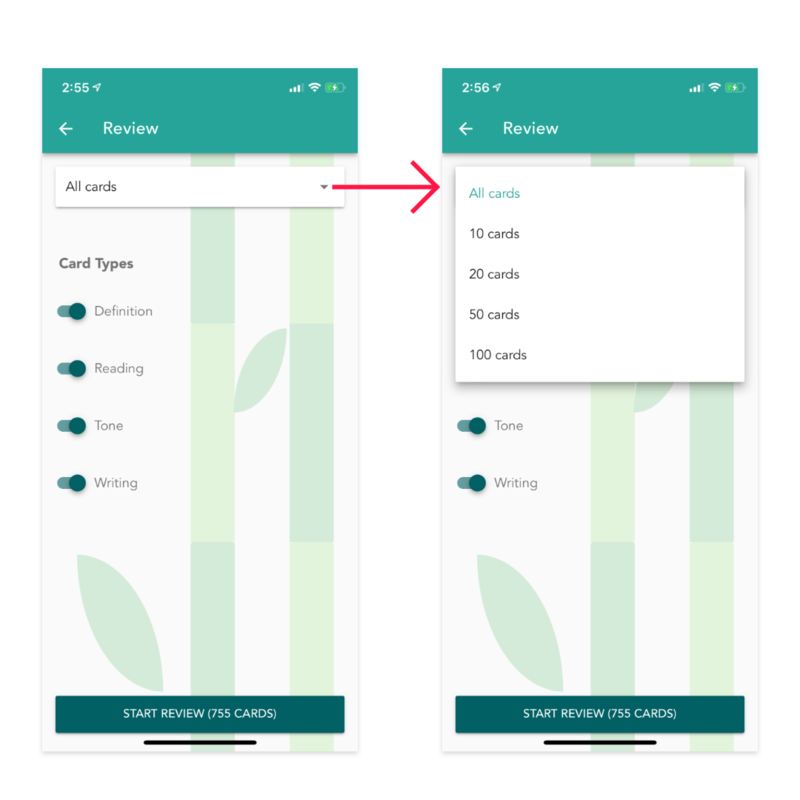 Select the amount of time between cards when a card marked as correct ("got it") and the other grades will advance faster or slower depending on what you choose. Auto play audio: Turning this off stops the app from automatically playing card audio while studying on Skritter. Tapping the audio icon on cards will still play word, character, or sentence audio if available. Auto reveal: Automatically show hidden information once a card has been fully answered. (ex. on a writing card like 明天 the hidden information will not be displayed until 天 has been written). Hide definition: Definitions are hidden on Reading cards and on Tone cards (Chinese only). They can be shown at any time by tapping "show definition" or at the end of the card if auto reveal is on. Hide reading: Readings are hidden on Definition cards and on Tone cards (Chinese only). They can be shown at any time by tapping "show reading" or at the end of the card if auto reveal is on. Bopomofo (Chinese only): Display Zhuyin instead of Pinyin. Study Kana (Japanese only): Enabled by default. 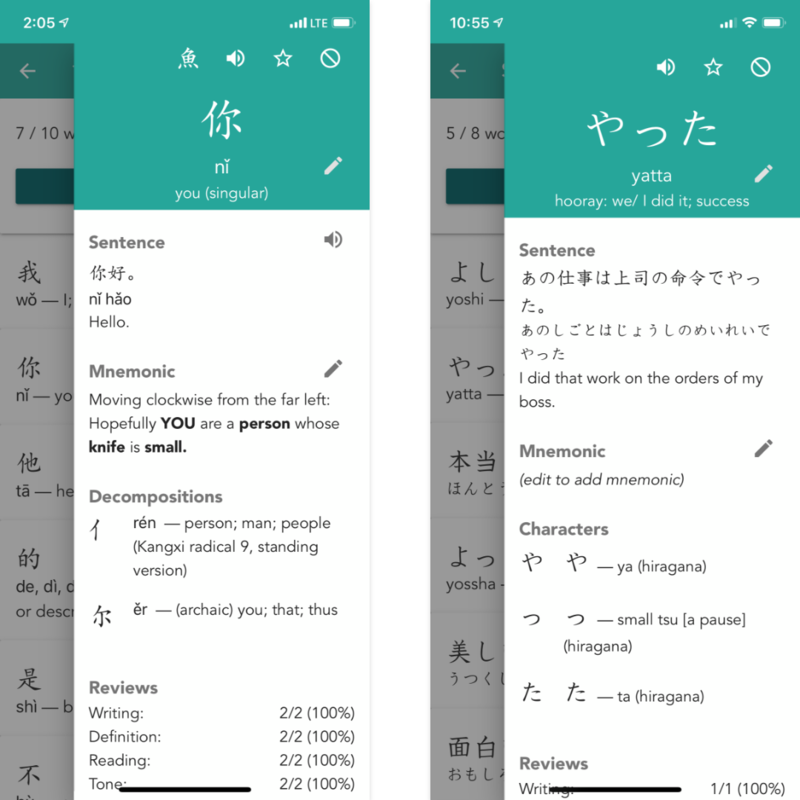 This allows you to study Kana handwriting and reading cards. Raw Squigs: A more authentic writing experience. No pretty stroke snapping what write is what you see on the canvas.